Fourteen pounds of apples may be just a few too many. I didn’t mean to purchase this many, I truly didn’t. 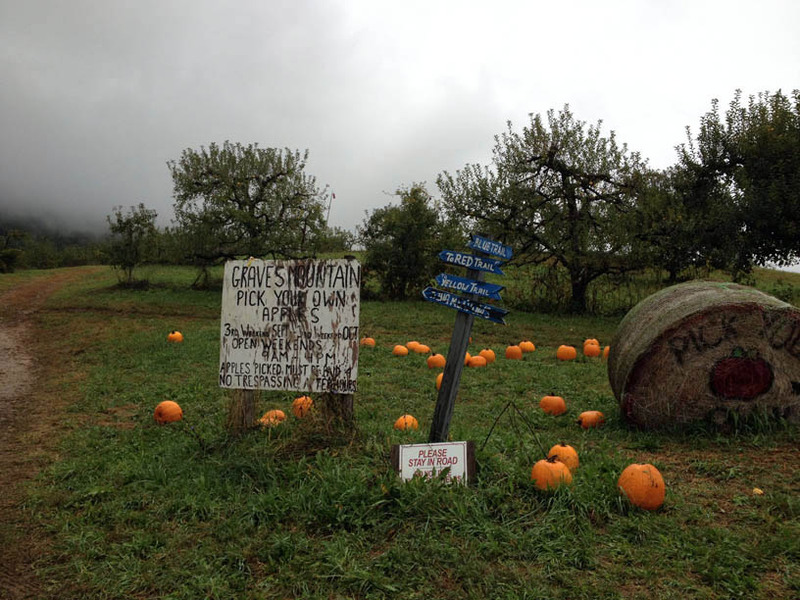 A half-bushel looked manageable at the orchard on a horribly rainy Sunday, but once home, the apples multiplied, filling bowls and counters, then forcing their way into every meal. When I was three and a half, apples became applesauce, end of story. In what’s become a story told every year, when I was itty bitty, my parents had detailed to me our plans for the next day. Dreams of orchards full of trees and bowls full of applesauce apparently danced in my head overnight. As my mom tells it, I popped out of bed at 6 a.m. the next morning, ran to her room and stood right next to her face. “Pick papples, make papplesauce!” I excitedly announced. No time for sleeping–we had important fall activities. 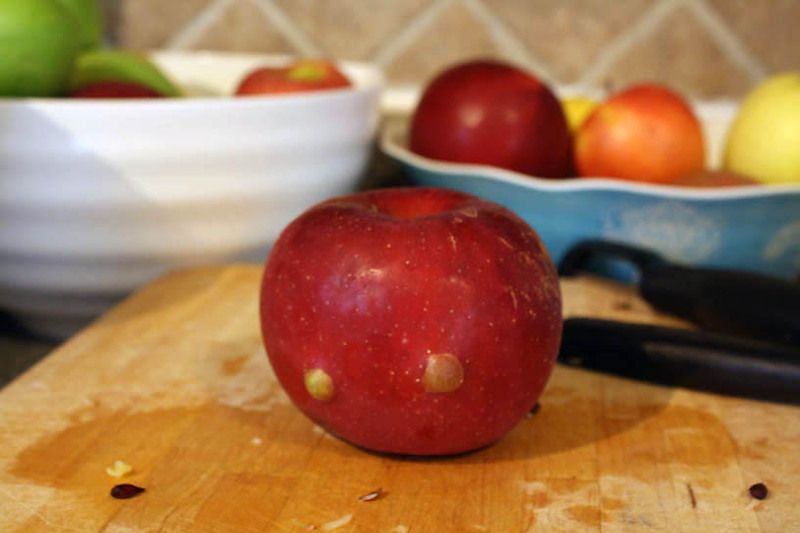 Just like picking strawberries and making jam has been a tradition for my whole life, so has finding fresh, local apples and making a simple, all-apple and no-sugar applesauce to stockpile in the freezer. Throughout the year, we’ll pull out the square Ziploc containers to enjoy our preserved fall bounty. 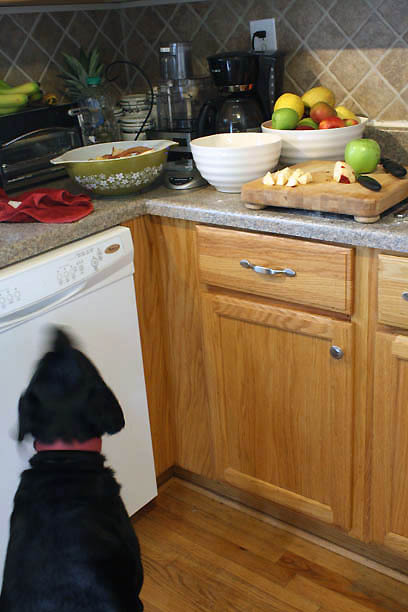 But that applesauce requires a food mill attachment on the Kitchen Aid mixer–and ample freezer space. It may be easy, but the process does require some time: First you quarter the apples (with peels and cores intact) and cook them down in a big pot. My family would often have two or three pots full of apples going at once. 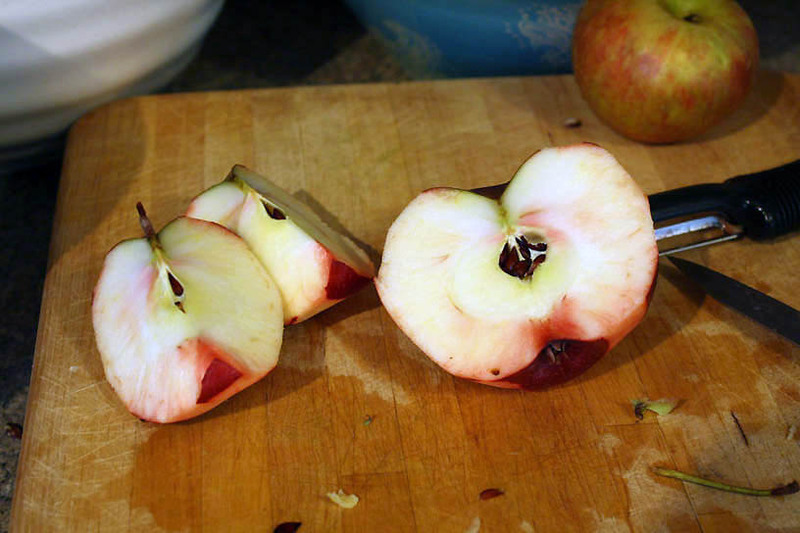 Once they’re soft, we’d ladle the apples into the top of the food mill, letting the machine do the work for us, separating the good apple parts from the seeds, core and peels. The sauce squeezes through the tiny holes on the cone while the “apple poop” goes into another bowl. And that’s it. I prefer the applesauce served just a tad warm with a sprinkle of cinnamon sugar. My parents cranked out a few batches a few weeks back, so I’ll just “shop” from their pantry and freezer when visiting, meaning I had no need to make my own recipe. 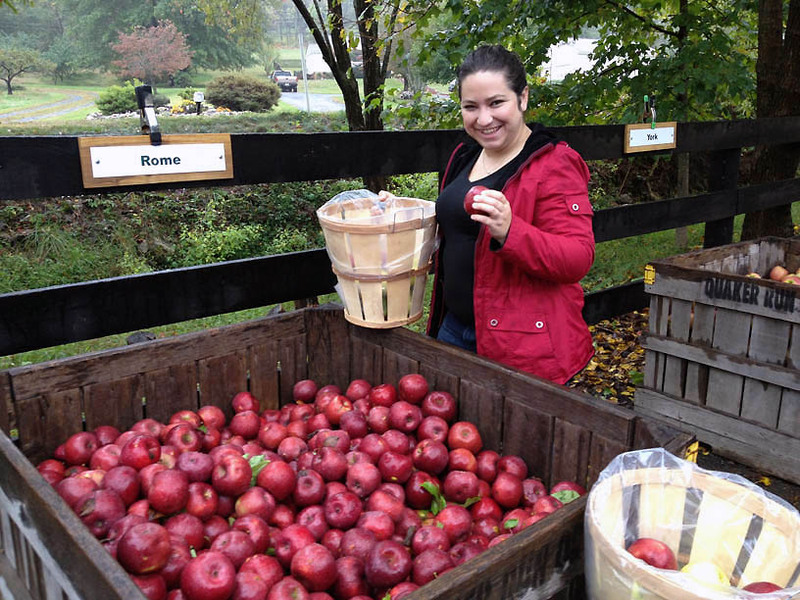 I wanted to be able to share my fondness for harvesting seasonal produce with Florida-native Robyn, who’d never picked apples, or strawberries before this spring. Near the end of a soul-sucking five-day rainy streak, we packed up our raincoats and drove the 1 1/2 hours to Graves Mountain Lodge in rural Syria. 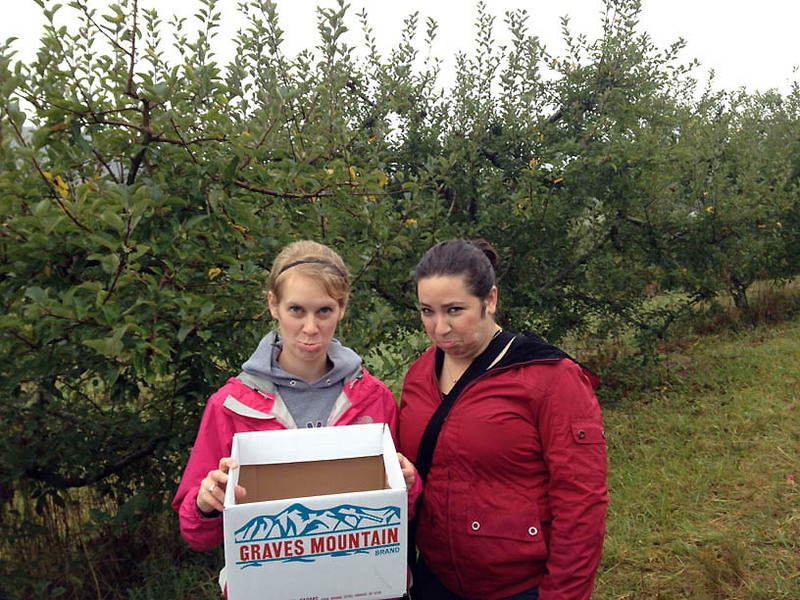 But alas, the trees weren’t cared for and the very few remaining apples high above were rotting; the good apples had been picked and were for sale out of boxes. 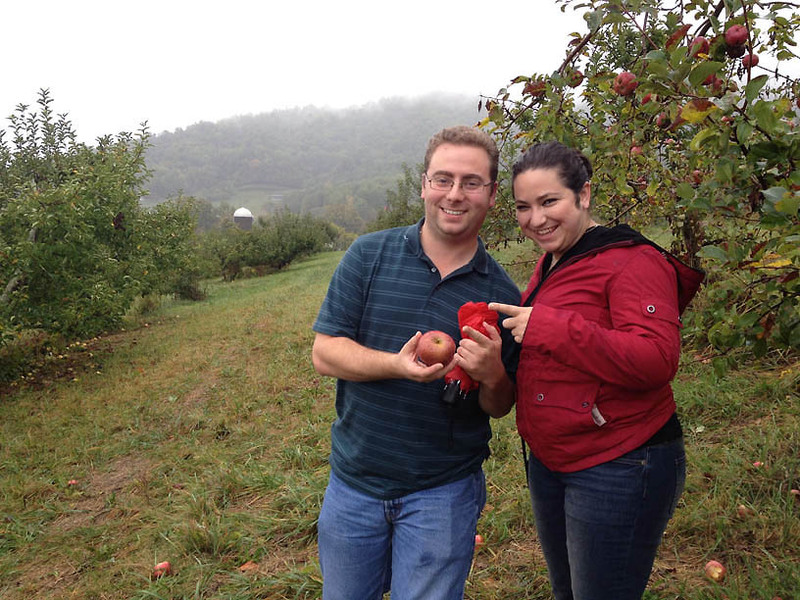 At least Robyn and Paul each got to pick a single apple–their first ever. Back in the car, we found another smaller orchard, but the man told us that he’d minutes earlier just cleared out the remaining fruits from the trees. All that was available could be “picked” from the holding crates. 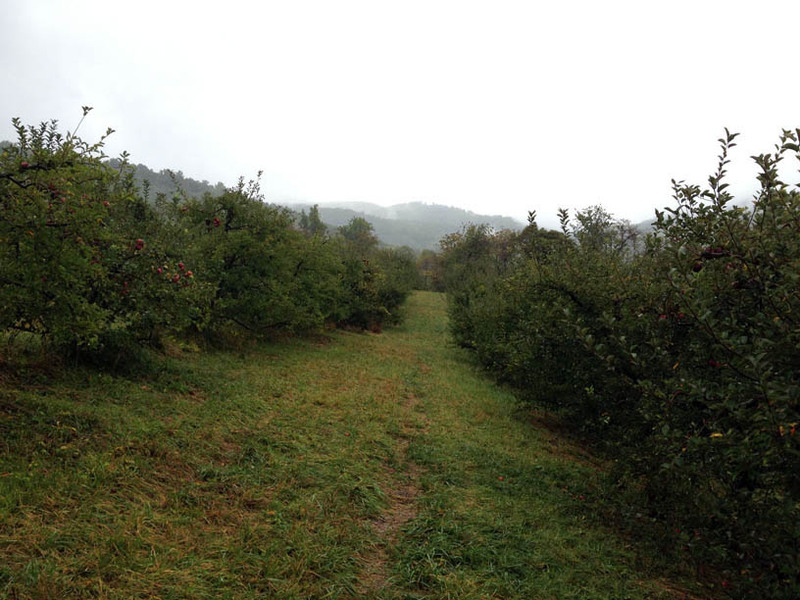 The situation certainly wasn’t ideal, but with rain coming down harder, wet feet draining what was left of our energy and no knowledge of other orchards in the area, we finally got our apples. That night, warm apple cake never tasted so good. 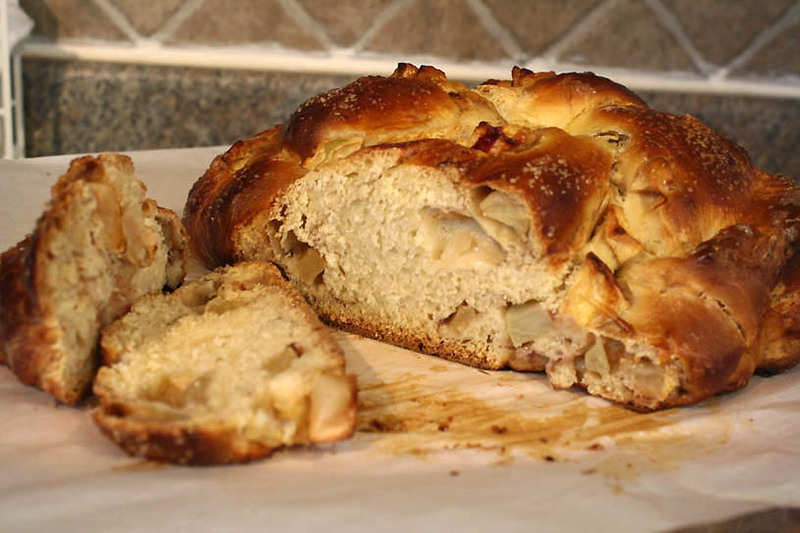 And that brings us to this weekend: What to do with all those apples. Without a cold storage spot to lengthen their life, I had to work my way through them, sooner than later. 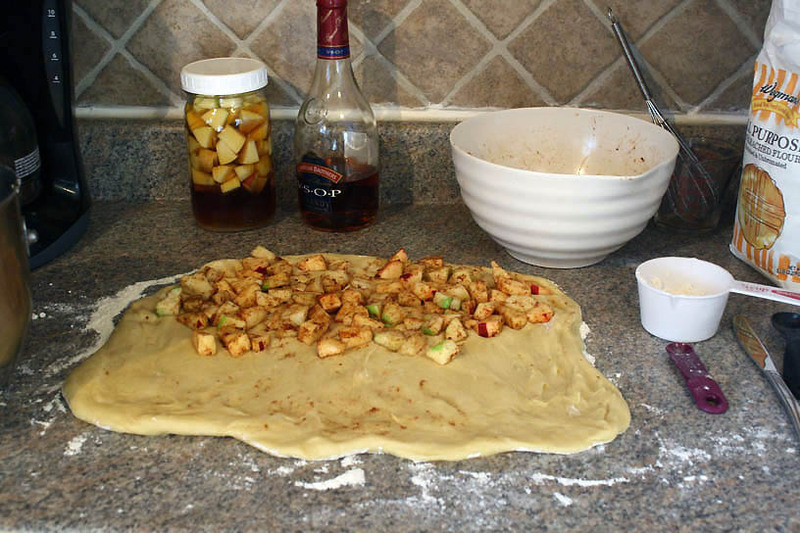 The plan had been to use many in a salted caramel apple pie from The Four & Twenty Blackbirds Pie Book, but a visit home allowed me to bake with my parents’ apples from Jamison’s Orchard instead. An apple a day for an afternoon snack, with another cooked into a bowl of oatmeal, wasn’t going to put a dent in the 14 pounds. Two went into a brandy infusion. Mixing fresh produce and alcohol yields a seasonal preserve unlike any other. Strawberry-infused rum could be enjoyed straight from a glass, while I’ve been shaking a blackberry-infused bourbon into whiskey sours with fresh squeezed lemons. 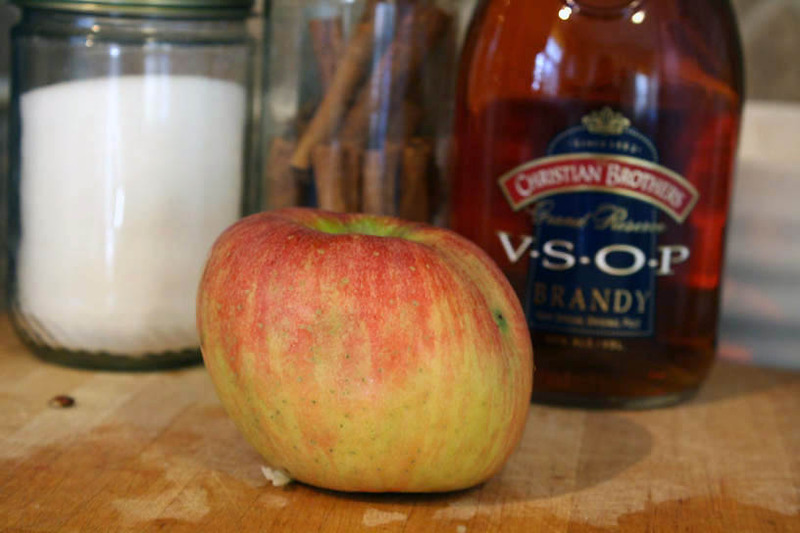 It’ll be another month or so before the apple-infused brandy will be ready, but I’m dreaming of a fall cocktail with apple cider and ginger ale, perhaps? My infusion is based on Sherri Brooks Vinton’s Put ‘Em Up! 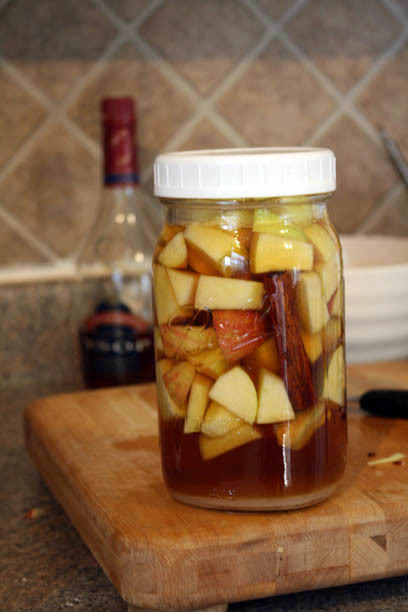 : In a quart jar, I combined two cored and chopped apples with 3-4 tablespoons of sugar, 2 cups of brandy and 1 cinnamon stick. The next ingredient is patience. Fortunately the other two creations could be enjoyed almost immediately. 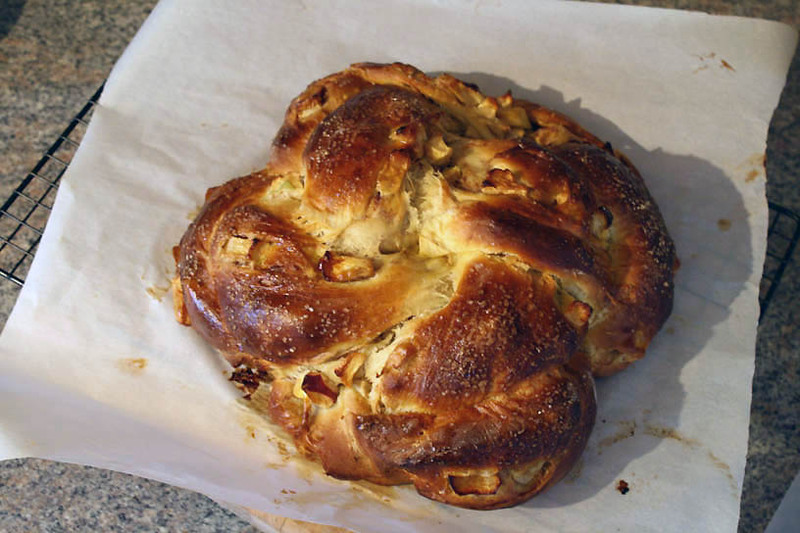 This apple and honey challah from Smitten Kitchen is incredible. 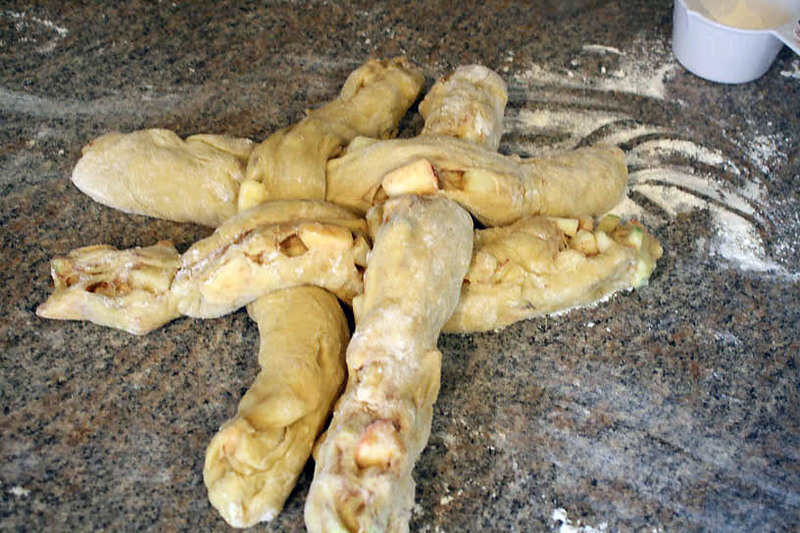 Keeping the cubes of cinnamon-coated apples in the ropes of dough while braiding in a circle proved a tad tricky, but even though I thought my round pre-bake looked a little forlorn, after about 50 minutes, the loaf had transformed into a thing of beauty. And my apple butter came from a few recipes melded together, including this “just apple butter” post from Sarah. 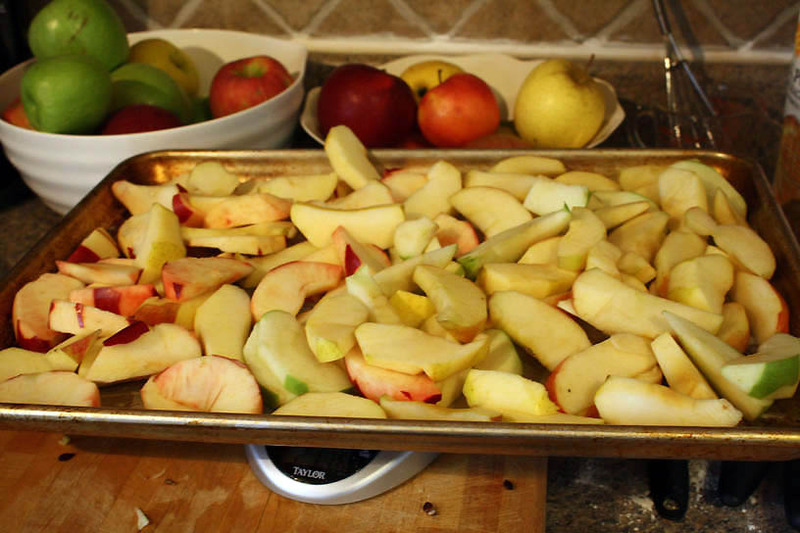 A few pounds of partially peeled, cored and sliced apples spent about two hours roasting in the oven, releasing juices and concentrating sugars. A splash of apple cider kept them from drying out. The soft apples then were pureed in a food processor with spices–cinnamon, cardamom, cloves and freshly grated nutmeg–along with a few tablespoons of brown sugar and juice from one lemon. I ended up cooking the mixture on low for a little longer on the stovetop to let it thicken slightly more, but that’s probably not necessary. This loose recipe yielded about four cups of apple butter. 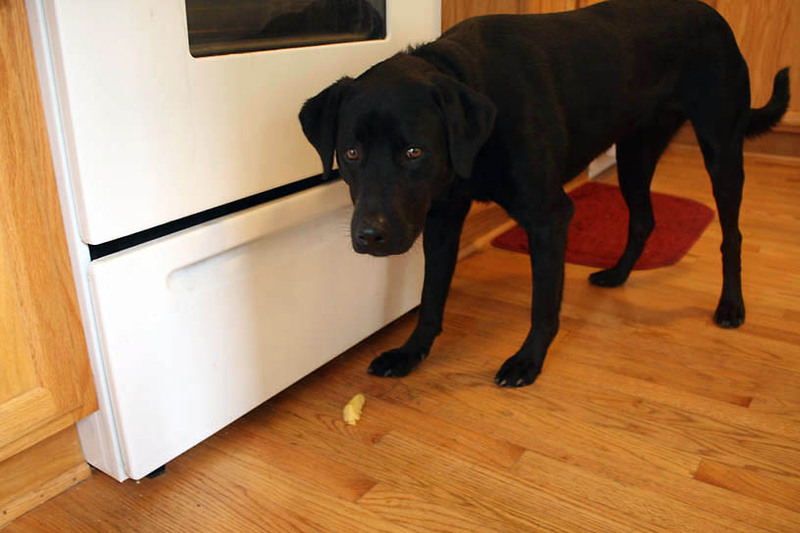 This apple is too hot for pups! One (large) bowl full of apples remains. Apple hand pies with a cheddar crust may be in my near future, or perhaps a sweet potato and apple pie from my new, beautiful pie book. 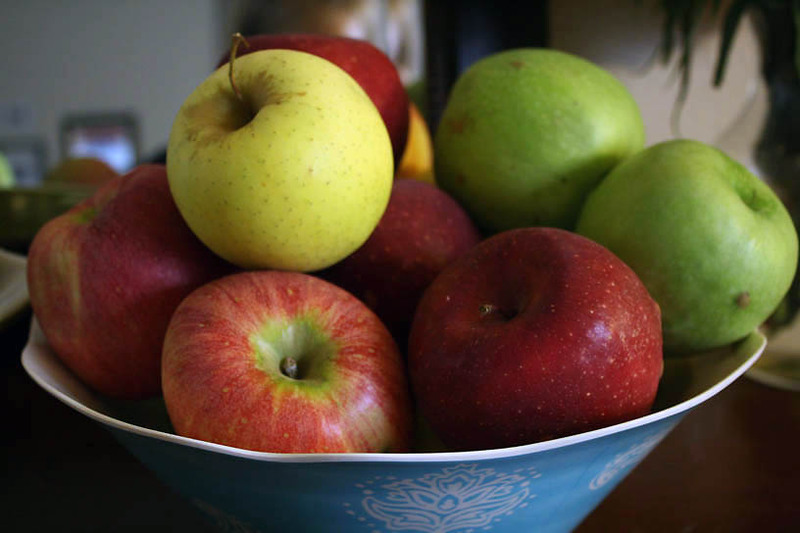 Apples on sandwiches or in salads or slaw could be nearing a necessity. Fourteen pounds of apples calls for more than an apple a day.